Operation Nemesis (Armenian: «Նեմեսիս» գործողութիւն Nemesis gortsoghut'iun) was a covert operation and an assassination campaign by the Armenian Revolutionary Federation (Dashnaktsutyun) carried out between 1920 and 1922, during which a number of former Ottoman political and military figures were assassinated for their role in the Armenian Genocide, as well as Azerbaijani figures for the 1918 massacre of Armenians in Baku. Shahan Natalie and Armen Garo are considered its masterminds. It was named after the Greek goddess of divine retribution, Nemesis. The Armenian Revolutionary Federation (ARF) was active within the Ottoman Empire in the early 1890s with the aim of unifying the various small groups in the empire who advocated for reform and a certain degree of autonomy within the empire. ARF members formed fedayi guerrilla groups that helped organize self-defense of Armenian civilians. In July–August 1914, the 8th congress of the ARF was a watershed event. Members of the Committee of Union and Progress requested from the party assistance in the conquest of Transcaucasia by inciting a rebellion of Russian Armenians against the Russian army in the event of a Caucasus Campaign opening up. The Armenians agreed to remain loyal to their government, but declared their inability to agree to the other proposal. Prominent ARF members were among the Armenian intellectuals targeted on April 24, 1915 in Istanbul. The arrested people were moved to two holding centers near Ankara under Interior Minister Mehmed Talat's order on April 24, 1915, and mostly deported and killed. In 1919, after the Armistice of Mudros, the Turkish Courts-Martial of 1919–1920 were convened in Constantinople, during which some of the principal perpetrators of the Armenian Genocide were convicted and sentenced to death. The UK seized some of the perpetrators from the Ottoman authorities in several of Istanbul's prisons, after their incompetency failed to hold fair trials, and transported them to the British colony of Malta. There, the Malta exiles (called so by Turkish sources) were, after Mustafa Kemal Atatürk's incarceration of Lord Curzon's relative, acquitted and exchanged for British prisoners of war by the new Turkish government of Atatürk. Since there were no international laws in place under which they could be tried, the men who orchestrated the genocide traveled relatively freely throughout Germany, Italy, and Central Asia. On May 28, 1918, the Armenian National Council, a group of professionals based in Tiflis declared the independence of the First Republic of Armenia. Hovhannes Kachaznuni and Alexander Khatisyan, both members of the ARF, moved to Yerevan, Armenia to seize power and issued the official announcement of Armenian independence on May 30, 1918. Yerevan became the capital city of Armenia. At this city, from September 27 to the end of October 1919, the ARF's 9th General Congress convened. The issue of justice against those responsible for the Armenian Genocide was on the agenda of the congress. Over many of the Russian Armenian delegates' vociferous objections, it was decided to mete out justice through armed force. ARF Bureau members, specifically Simon Vratsyan, Ruben Ter Minasian and Ruben Darbinian, opposed Shahan Natalie's operation. However, a "black list" was created, containing the names of 200 persons deemed responsible for organizing the genocide against the Armenian people. 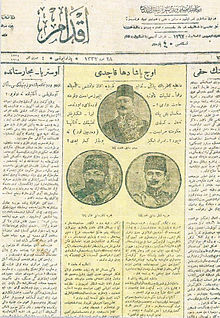 The front page of the Ottoman newspaper İkdam on 4 November 1918 after the Three Pashas fled the country following World War I. Showing left to right Djemal Pasha; Talaat Pasha; Enver Pasha. The leader of the group responsible for the task was Shahan Natalie, working with Grigor Merjanov. For Natalie, the primary target was Talaat Pasha, whom Shahan called "Number One". The mission to kill Talaat was entrusted to Soghomon Tehlirian. Natalie's aim was to turn Tehlirian's trial into the political trial of those responsible for the Armenian Genocide. In his memoirs, Natalie revealed his orders to Tehlirian: "you blow up the skull of the Number One nation-murderer and you don't try to flee. You stand there, your foot on the corpse and surrender to the police, who will come and handcuff you." On July 24, 1923, the Treaty of Lausanne, in Lausanne, Switzerland, settled the Anatolian and East Thracian issue of the partitioning of the Ottoman Empire by annulment of the Treaty of Sèvres that was signed by the Constantinople-based Ottoman government. After the Sovietization of Armenia, many of the First Armenian Republic's expatriate revolutionary activists did not hesitate to collaborate with Azeri and Turk Armenophobe activists to regain governmental control. This policy was contrary to Shahan Natalie's conviction that "Over and above the Turk, the Armenian has no enemy, and Armenian revenge is just and godly." There was deep dissent on both sides, but not yet to the point of separation. To forestall the probable victory of these "freedom fighters" at the upcoming 11th General Congress of the ARF (27 March to 2 May 1929), on the eve of the meeting, the Bureau began a "cleansing campaign". The first to be "removed" from the party was Bureau member Shahan Natalie. "Knowingly" (by his definition) having joined the ARF and unjustly separated from it, Shahan Natalie wrote about this: "With Shahan began again that which had begun with Antranig; Bureau member, Shahan, was 'ousted'." After Shahan were successively ousted Haig Kntouni, Armenian Republic army officer Bagrevandian with his group, Glejian and Tartizian with their partisans, General Smbad, Ferrahian with his group, future "Mardgots" (Bastion)-ists Mgrdich Yeretziants, Levon Mozian, Vazgen Shoushanian, Mesrob Kouyoumjian, Levon Kevonian and many others. As a protest to this "cleansing" by the Bureau, some members of the ARF French Central Committee also resigned. On 31 May 1926, the Turkish government passed Law Nr 882, which granted property to the families of Ottoman leaders assassinated for their role in the Armenian Genocide. This law covered the relatives of prominent CUP members, including Talaat Pasha, Ahmet Cemal Pasha, Sait Halim Pasha and Behaeddin Shakir, among others. The legislation added they would be given property belonging to "fugitive Armenians". MP Recep Zühtü Soyak, the close confidante and private secretary of Ataturk said this new law was a strong "warning message to assassins: you may execute a Turk through an assassination! But, we will raise his offspring with your money so that tomorrow, he will gouge out your eye and break your head." ^ a b c Motta, Giuseppe (2013). Less than Nations: Central-Eastern European Minorities after WWI, Volume 2. Cambridge Scholars Publishing. p. 18. ISBN 9781443854290. ^ Frey, Rebecca Joyce (2009). Genocide and International Justice. New York: Infobase Publishing. p. 82. ISBN 9780816073108. ^ Reidel, James (24 April 2015). "The Epic of a Genocide". The New York Review of Books. In the years following the war, the atrocities committed against the Armenians surfaced in the news stories, some tied to the revenge shootings of Talaat Bey, Jemal Pasha, and other wartime Turkish leaders, victims of an Armenian revolutionary assassination program with the chilling name of "Operation Nemesis." ^ Totten, Samuel; Jacobs, Paul R. Bartrop (2008). Dictionary of genocide. Westport, Conn.: Greenwood Press. p. 320. ISBN 9780313346415. ^ Freedman, Jeri (2009). The Armenian genocide (1st ed.). New York: Rosen Pub. Group. p. 42. ISBN 9781404218253. ^ Eminian, Sarkis J. (2004). West of Malatia: The Boys of '26. Bloomington, IN: AuthorHouse. p. 3. ISBN 9781418412623. ^ Newton, Michael (2014). Famous Assassinations in World History: An Encyclopedia [2 volumes]. ABC-CLIO. pp. 269–70. ISBN 1610692861. ^ Charny, Israel W.; Tutu, editor in chief; forewords by Archbishop Desmond; Wiesenthal, Simon (2000). Encyclopedia of genocide (Repr. ed.). Oxford: ABC-Clio. ISBN 0874369282. ^ "Turkey's EU Minister, Judge Giovanni Bonello And the Armenian Genocide - 'Claim about Malta Trials is nonsense' - The Malta Independent". Independent.com.mt. 2012-04-19. Retrieved 2016-11-17. ^ a b Power, Samantha. "A Problem from Hell", p. 16-17. Basic Books, 2002. ^ Hovannisian. "Armenia's Road to Independence", p. 298. ^ "ARTICLE 91". Wwi.lib.byu.edu. Retrieved 2016-11-17. All grants of patents and registrations of trade-marks, as well as all registrations of transfers or assignments of patents or trade marks which have been duly made since the 30th October, 1918, by the Imperial Ottoman Government at Istanbul or elsewhere..
Yerganian, Aram (1949). Այսպէս Սպաննեցինք (In this way, we killed) (in Armenian). Los Angeles. Shiragian, Arshavir (1976). The Legacy. Sonia Shiragian. Boston, Massachusetts: Hairenik Press. LCC 76-49796. Bogosian, Eric (2015). Operation Nemesis: The Assassination Plot that Avenged the Armenian Genocide. Little, Brown and Company. ISBN 978-0316292085. This page was last edited on 3 February 2019, at 01:58 (UTC).